Correct Flat Feet: Silicone Gel Flat Foot Insole gently repositions the sole of the foot for comfortable lifting throughout the day. Reduces over pronation and treats flat feet and its associated symptoms. Helps redistribute pressure away from your arches. Treat Foot Pain: Get instant relief from painful arches with this silicone gel arch support. By Cushioning, this gel insole supports your heel and arch to reduce pressure and the pain that it causes. fallen arches, pain in the heel i.e. plantar fasciitis, and heels spurs as well as metatarsal and Morton's neuroma. All Day Comfort: This Arch Supports Provide Pain Relief and Support 24 Hours a Day, Every Day. 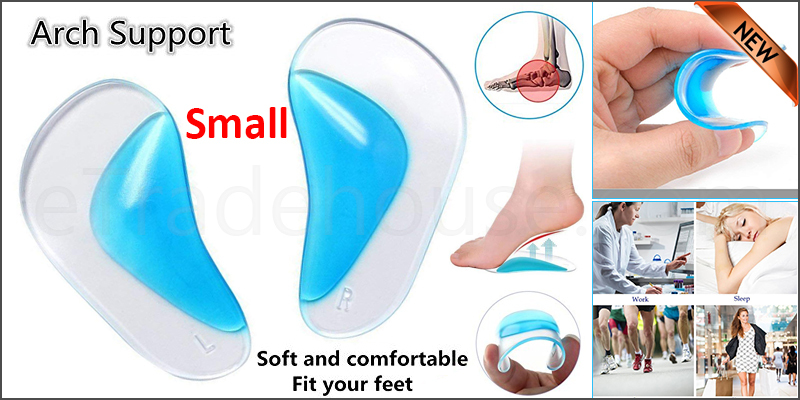 High Quality Material: Made of High Quality Soft and Durable Medical Grade Soft Silicone Gel Material, safer and more soft, relieve the arch fatigue all day, to give foot more support, make the walking more comfortable. Suitable For All Shoes: for flats, sandals, high heels, dress shoes and other shoes with the smooth leather insole.